The Decadal Anniversary is coming up and I will be posting some material regarding the earthquake and tsunami that changed the lives of millions. This Mw 9.15 earthquake, slightly smaller in magnitude than the M 9.2 Good Friday Earthquake of 1964/3/27, was devastating as over 200,000 people lost their lives. We hope that their lives were not lost in vain as we attempt to learn many lessons from the results of our observations following this earthquake and tsunami. This post will cover the initial observations and I will follow up with material that was found later. In 2004 many people had the belief that the historical seismicity for a fault related directly to the seismic potential of that fault. Not everyone held this belief, especially those that recognized that many large fault systems had recurrence intervals (average time between earthquakes of a given magnitude) that were longer than the record of seismicity for those fault systems. Seismologic records (records from seismometers) only extend back about a century. Large plate boundary faults, those with the possibility of generating large magnitude earthquakes, the possibility of generating large ground shaking, and the potential to exert significant hazard to people and their possessions (e.g. bridges, schools, and hospitals) have recurrence intervals ranging from centuries to millenia. In addition, these large plate boundary systems seem to also have larger strain cycles that result in a variation of earthquake magnitude through time (aka “supercycles,” Sieh et al., 2008). In other words, there may be a series of smaller large magnitude earthquakes in-between larger large magnitude earthquakes. This cycling of magnitude variation may produce a series of earthquakes, each separated by the mean recurrence time of centuries, with magnitudes in series: Mw 8, Mw 7.5, Mw 8.2, Mw 9.2, Mw 8, Mw 7.8, Mw 7.6, Mw 8, Mw 7.5, Mw 9.5. 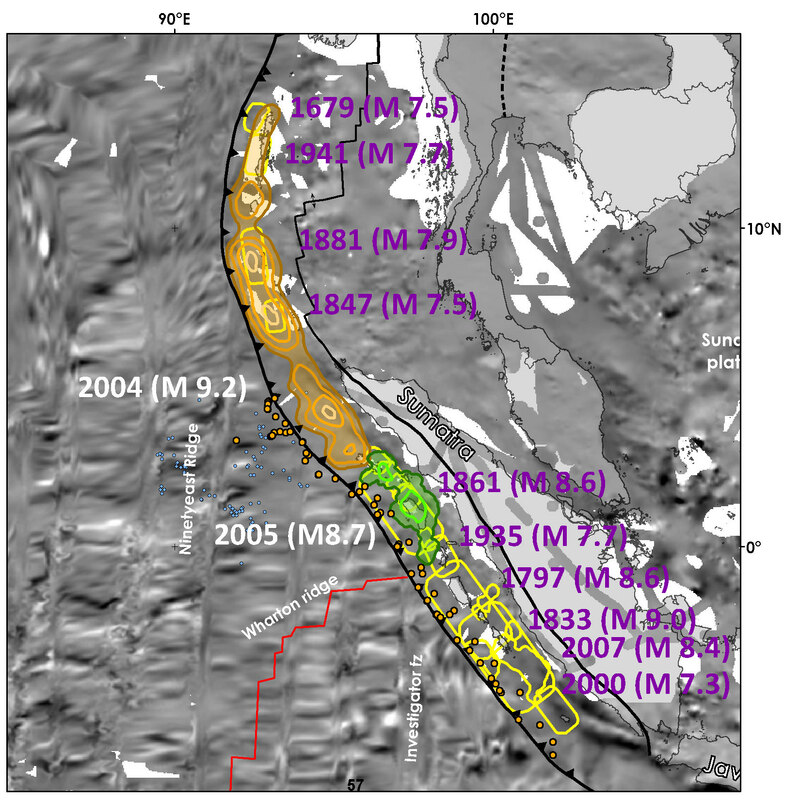 Here, of 11 earthquakes, only 2 are larger than Mw 9, but each are separated by centuries. Given such a short instrumental record of earthquakes, we can all now recognize that we do not know enough about plate boundary earthquakes to effectively evaluate their hazard (unless we might be a seismologist, though many of them are coming around). 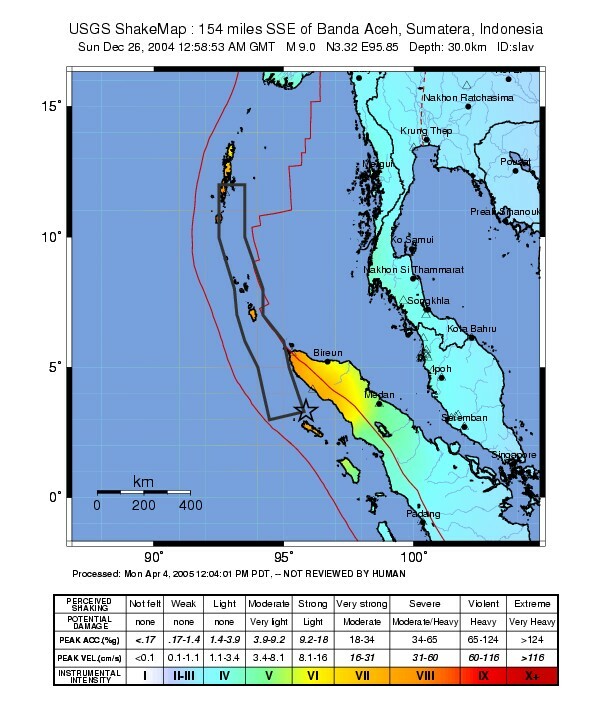 Prior to December 2004, this region of the Sunda subduction zone had only had earthquakes of magnitude less than M 8. Therefore, people did not expect a larger earthquake there. They were incorrect (I did not know any better either, but was not thinking of this subduction zone at this time in my life. I worked primarily on Cascadia, which also has not had an historic large magnitude earthquake.). Here is a map showing the historic earthquake regions. 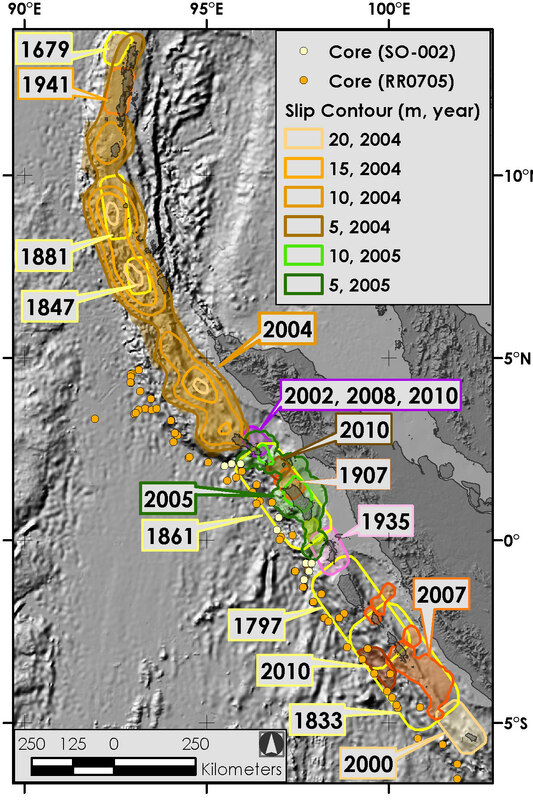 Earthquake slip contours are shown for the 2004 and 2005 earthquakes. Some references for these earthquake sources include: Newcomb and McMann, 1987; Rivera et al., 2002; Abercrombie et al., 2003; Natawidjaja et al., 2006; Konca et al., 2008; Bothara, 2010; Kanamori et al., 2010; Philibosian et al., 2012. This map shows the magnitude of these historic earthquakes overlain upon a map showing the magnetic anomalies. I will discuss the tectonic significance of these anomalies later. This map also includes the plate motion vectors, regional plate boundaries, and the extent of the Bengal and Nicobar fans. 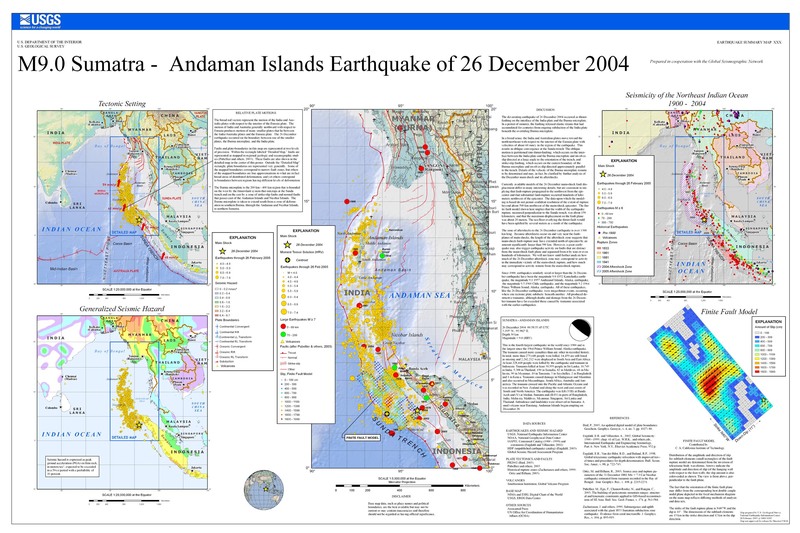 Here is the USGS poster for this earthquake. These results were put out very soon after the earthquake and later reports made more refined analyses. For example, there are over a dozen earthquake slip models for this earthquake, most all are better than this initial USGS version. This is the modeled shaking intensity map generated by the USGS, using the Modified Mercalli Intensity Scale. 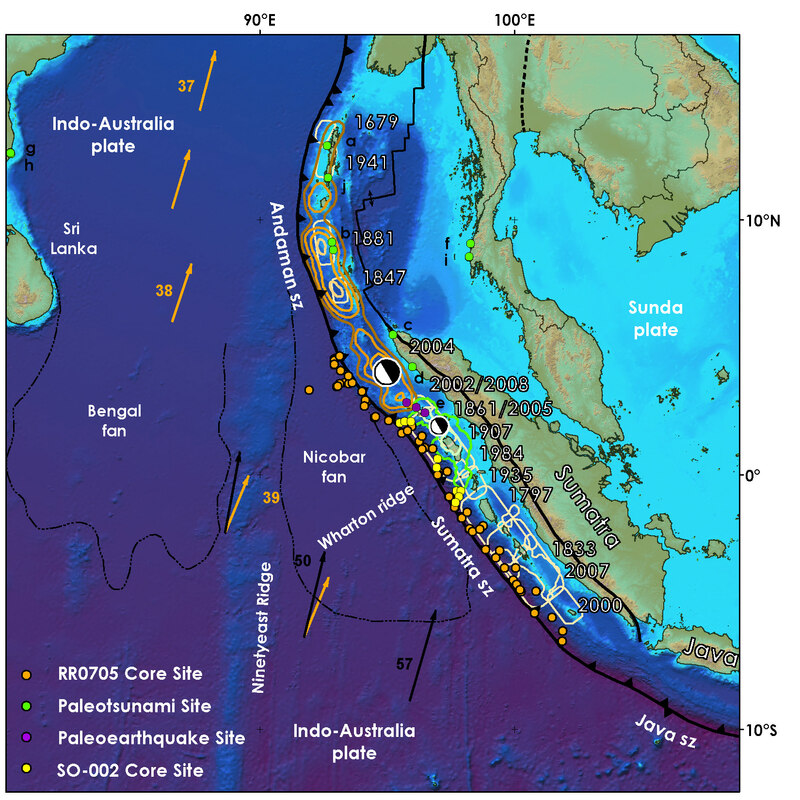 This map is based on numerical modeling of the fault slip and is preliminary. Compare it with the next map, which is based upon observations from real people. I will write a little more about the MMI scale in the coming week. Here is the Did You Feel It map, which is based on felt reports by people who could submit their observations via the USGS website. Here is some eye candy to get us rolling. This is a figure from Chlieh et al. (2007). 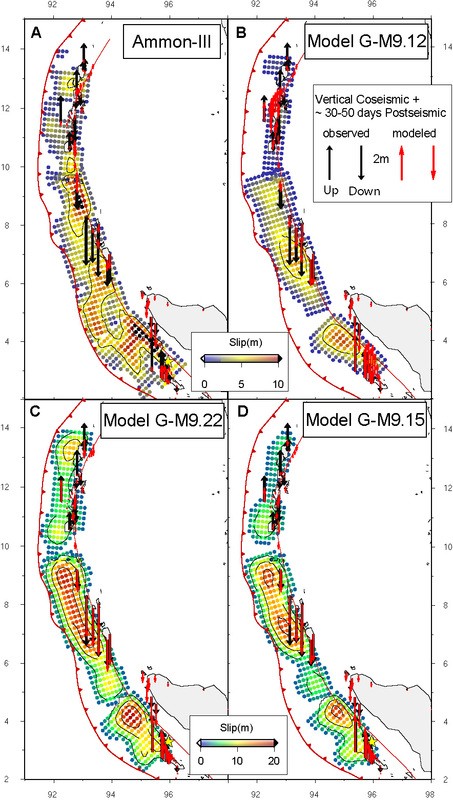 These figures show different versions of their slip model as they relate to observations (black vectors) and models (red vectors) of uplift and subsidence. Vectors are arrows that show sense of motion (in this case, up or down) and some magnitude (in this case, amount of vertical motion). Its in the news everyday this week here in Bangkok.